Are you looking for an easy way to send home activities for your speech and language students to practice their skills? 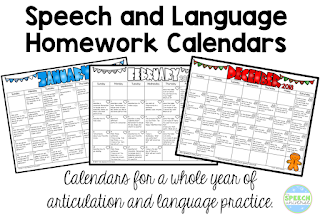 I have been using these calendars for years now, and have had great responses from my students and their parents! I have a set of articulation calendars and a set of language calendars. Both sets are updated every calendar year as well as at back to school time. There are color versions of the calendars as well as black and white for a low ink option. If you have access to color printing at your school, I suggest using the color versions- they are bright and fun! The black and white versions are fun too, and students can color the pages themselves. 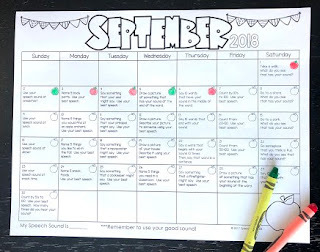 Each day on the calendar has a small icon in the corner that students can color in when they complete the task. In each set of calendars, there is also a parent letter and communication log that can be sent home. The parent letter describes how to use the calendars. The communication log gives parents a chance to let you know what went well and what the student needed help with. These calendars are available at my TpT store in a BUNDLE or you can purchase the articulation or language calendars separately.